Rare terrestrial globe made according to the knowledge of Giovanni Maria Cassini (Venice 1745 - Rome 1824) regular cleric of the Padri Somaschi, an order proposed in Venice in 1525 and founded in Somasca, in Lombardy in 1532. Updated according to the latest discoveries in 1843 by Calcografia Camerale, the papal publishing house. Measures: 50 x 50 cm, sphere diameter 33 cm. Very good condition. Large 'Papier Machè' terrestrial globe with gores printed in calcography an color finished, on a wooden tripod. One compass joints the three feet. Maker Cary, London, England, 1798. By Charles Delagrave, Paris. On ebonised turned wood stands with circular base, (30 x 30 x 50cm). Measures: 12 inch. A rare and small terrestrial globe, papier maché, caged into a brass armillary structure, with tall foot and mahogany wood base. France, Paris, signed Delamarche. 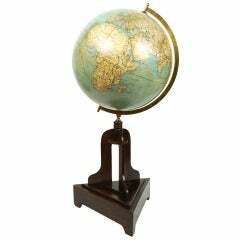 18 inches English paper mâché library terrestrial globe, wooden horizon circle, cast iron tripode with three wheels. W.& A.K Johnston to the Queen, 1890. Edinburgh & London.